IU senior Shannon Lemajeur has a passion for law and politics. As a double major in political science and Spanish, she studies Hispanic culture and government. Lemajeur also gets to work hands-on with her interests in her new role as a commissioner on the Bloomington Commission on Hispanic and Latino Affairs. Lemajeur applied for the position and was appointed by the mayor. 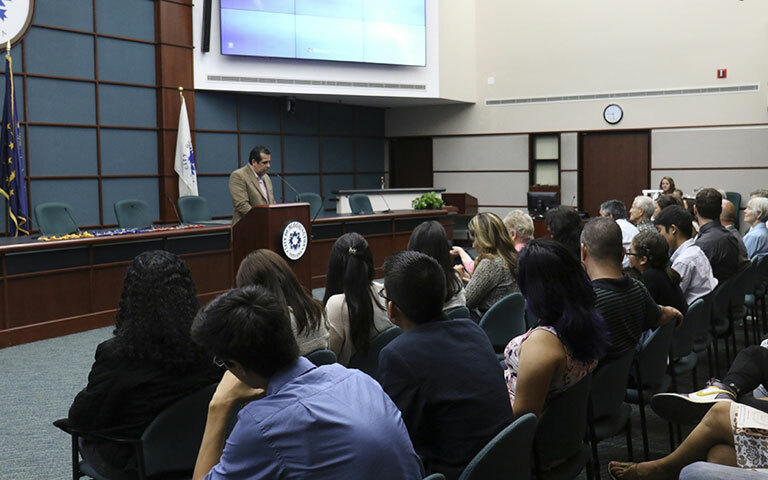 The Commission on Hispanic and Latino affairs works within the Bloomington community to advance Hispanic and Latino issues by organizing events and working to improve educational, working and economic aspects of Hispanic and Latino lives, Lemajeur said. Lemajeur herself is not Latino, but she said as president of IU’s Spanish club, she has always been interested in Spanish and wanted to expand her work with it outside of the University and into the community. Within the commission, Lemajeur will focus on the political aspect of Latino lives. She said she plans to improve voter awareness and work with Bloomington elementary and middle schools to improve civic education. Beyond her political focus, Lemajeur will work with the commission to address the variety of issues Hispanic and Latino people face in Bloomington. Lemajeur said while there is no single issue that affects Latinos the most, she thinks education, health and inclusion are all important issues to focus on. Lemajeur said working and health conditions for those who are undocumented is also an issue in Bloomington. She said there is a fear of facing authorities and ultimately deportation. Despite the challenges Latino and Hispanic people may face, Lemajeur said she wants them to feel welcomed in the community. “It’s so important that they are not ostracized and enjoy the same resources as everyone who is not Latino,” Lemajeur said. To tackle these issues, Lemajeur will work alongside the commission which is made up of members from around the Bloomington community, including a professor, a social worker and a police officer. The professor is Israel Herrera, an IU Spanish professor who has known Lemajeur for three years and advised her to apply for the commission. Herrera, a native of Colombia, said he has worked on the commission for five years. He said he has interest in working with human rights and education and proposing different events or activities for the Latino and Hispanic population in Bloomington. Herrera said Lemajeur will be a good addition to the commission because she has political and Spanish knowledge.